Summer can be a bit hit and miss in the UK. So when the sun does come out, a glass of prosecco from Premier Estates Wines is a perfect way to celebrate! Gin is perfect all year around, but some feel particularly suitable to winter drinks. 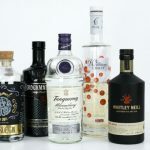 So I thought I’d take a look some of my favourite gins to drink right now. Looking for alcohol-free drinks options? If you’re bored of yet another diet cola, the Fentimans range of soft drinks is something a little bit different. Love Gin? Looking for a gift for a gin loving friend, or just a treat for yourself? Here are five gins that you might not have heard of. Any time of year is the right time for a picnic! My Raspberry Lemonade is deliciously refreshing, and ever so easy to make.